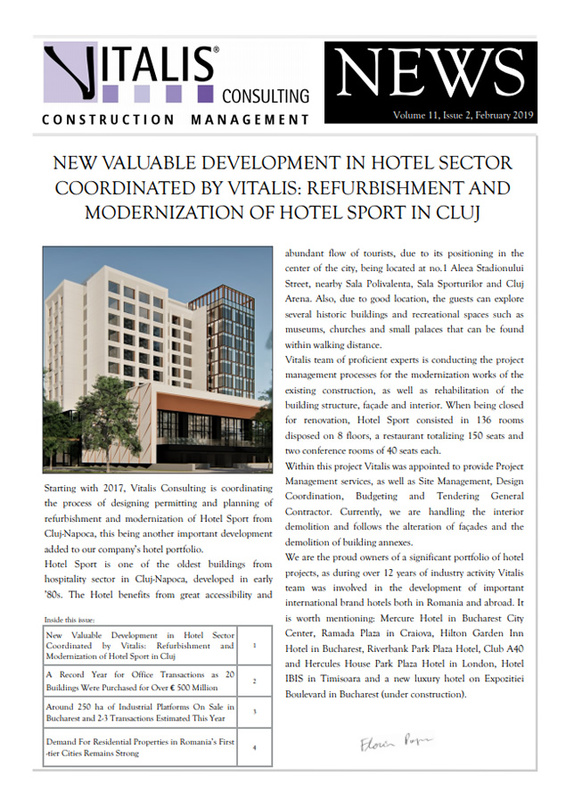 Starting with 2017, Vitalis Consulting is coordinating the process of designing permitting and planning of refurbishment and modernization of Hotel Sport from Cluj-Napoca, this being another important development added to our company’s hotel portfolio. Hotel Sport is one of the oldest buildings from hospitality sector in Cluj-Napoca, developed in early ’80s. The Hotel benefits from great accessibility and abundant flow of tourists, due to its positioning in the center of the city, being located at no.1 Aleea Stadionului Street, nearby Sala Polivalenta, Sala Sporturilor and Cluj Arena. Also, due to good location, the guests can explore several historic buildings and recreational spaces such as museums, churches and small palaces that can be found within walking distance. Vitalis team of proficient experts is conducting the project management processes for the modernization works of the existing construction, as well as rehabilitation of the building structure, façade and interior. When being closed for renovation, Hotel Sport consisted in 136 rooms disposed on 8 floors, a restaurant totalizing 150 seats and two conference rooms of 40 seats each. Within this project Vitalis was appointed to provide Project Management services, as well as Site Management, Design Coordination, Budgeting and Tendering General Contractor. Currently, we are handling the interior demolition and follows the alteration of façades and the demolition of building annexes. 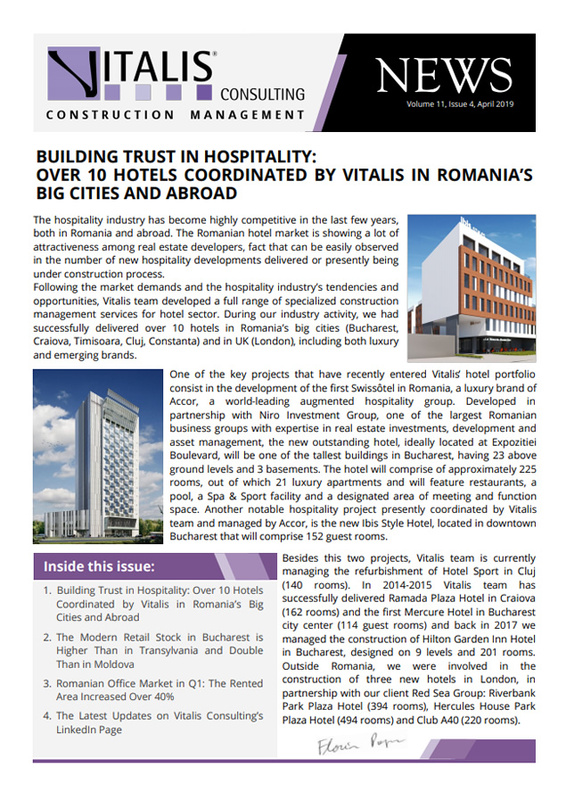 We are the proud owners of a significant portfolio of hotel projects, as during over 12 years of industry activity Vitalis team was involved in the development of important international brand hotels both in Romania and abroad. It is worth mentioning: Mercure Hotel in Bucharest City Center, Ramada Plaza in Craiova, Hilton Garden Inn Hotel in Bucharest, Riverbank Park Plaza Hotel, Club A40 and Hercules House Park Plaza Hotel in London, Hotel IBIS in Timisoara and a new luxury hotel on Expozitiei Boulevard in Bucharest (under construction). Office building transactions reached the highest level of the last decade in 2018, as only in Bucharest 20 assets with a total GLA of ​​220,000 square meters and a value of more than 500 million euros were transacted, according to a market research. A number of office buildings were also sold in Cluj-Napoca and Timişoara, as the total office building transaction volume in Romania in 2018 was of 531 million euros, representing a 55% share of the investment volume. In total, investors committed 957 million euros to the local real estate market last year, with the retail (33% market share) and industrial (9%) segments occupying the second and third positions in terms of investors’ interest. Investors have been interested both in “trophy” assets built by renown developers, with a portfolio of international tenants with long-term commitments, and also in secondary buildings, which can generate robust returns. The flow of new investors into Romania is expected to continue in 2019, attracted by the higher returns achievable compared to other CEE markets. With this trend, prime yields in the office and industrial markets are expect to compress by between 25 – 50 basis points. This is driven by more prime assets expected to be transacted and a higher level of competition among investors for the best properties. However, for this growth to continue to its maximum potential, it is essential that Romania promotes and continues its economic growth and does better to give investors confidence in the stability of the business environment. In Central and Eastern Europe (Poland, the Czech Republic, Hungary, Slovakia and Romania), real estate properties with a cumulative value of 13 billion euro were transacted in 2018, the largest market being Poland, with a share of 55%. Compared to the previous year, the volume of transactions in the region increased by 15%. While yields on the acquisition of prime office buildings in Bucharest remained constant, at 7.25%, the investment returns continued to decline in the other CEE countries, reaching 4.75% in Warsaw and 4.40% in Prague. According to real estate specialists, there are around 500 hectares of unstructured industrial platforms in Bucharest, and approximately half of them are on sale. Extremely few of these platforms still have industrial activity and most have either been renovated and are being used as spaces for rent (B/C class offices or warehouses) or are demolished and ready for immediate sale. Besides the industrial platforms, a similar surface area is free and available for sale in areas such as Sisesti, Straulesti or Pipera, which have become an attraction for investors lately due to the proximity of the new office centers. In this case too, there is a wide range of plots, from hundreds of square meters lots, suitable for individual houses or blocks, to properties of 10-15 hectares. The dynamic of the real estate market has led to a series of important land transactions over the past two years, where is estimated that nearly 200 hectares of Bucharest, consisting of industrial platforms and large open land, have found new owners. The trend will continue in the next period, with the highest interest in the central and northern areas. At the same time, after 2-3 extremely active years, when developers made a good stock of land, but also due to the moderation of the economy and the slowdown on the residential market, the new demand for land will be below that of the previous years. Interest in the Bucharest market exists at this moment on all segments, but not at the same intensity as in the last few years. Active developers have different strategies, depending on each one’s specialization. Large plots are sought for mixed projects – usually office plus residential or residential plus retail. In addition, there is an appetite for small and medium land acquisitions of 5,000 to 10,000 sq. m for stand-alone retail or office projects or boutique residential buildings. The demand for housing in major cities such as Bucharest, Cluj-Napoca, Timisoara, Iasi, Sibiu or Constanta will remain high this year, so developers will continue to invest in building blocks, and prices will follow the same moderate growth trend seen in 2018, according to a report drafted by real estate consultancy specialists. Against this backdrop, developers are unlikely to reduce prices, the report reasoned. On the contrary, a stronger euro, higher financial cost, rising prices for construction materials and costlier labour force will likely increase prices “by a few percentage points,” but at a much slower pace than in recent years, the report concluded. Romania is subject to geographic polarisation more and more, from an economic point of view. Labour force migration from rural to urban areas has significantly increased the demand for housing, as authorities are delaying to take the necessary measures to alleviate regional disparities. Lack of investments in poor counties, low wages in urban areas compared to those in the urban areas and poor infrastructure will continue to cause Romanians to move to the city, particularly as the migration to Western countries is no longer as vigorous as in previous years.